Learn to build a simple but cute bunk bed for 18″ dolls like the American Girl Dolls or the Our Generation line of dolls. This bed size is patterned after manufactured 18″ doll beds and fits the dolls comfortably. 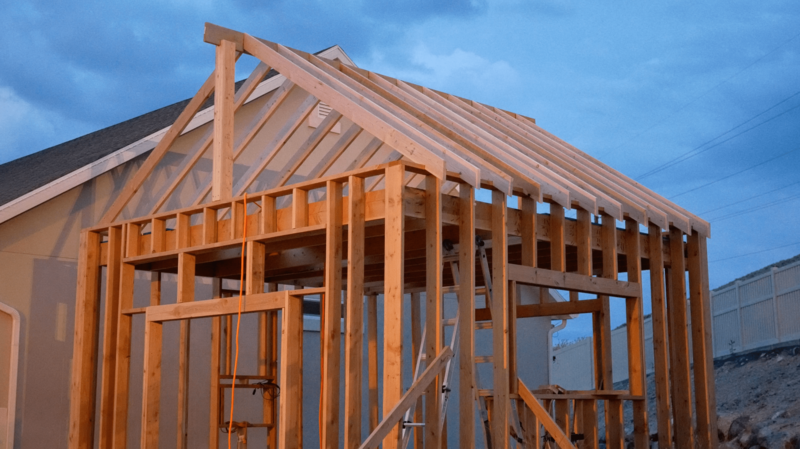 The plans use simple and available lumber, including 2x4s or 2x2s, 1x4s, 1/2″ plywood and 1/8″ plywood. You can also substitute the 1/8″ plywood for 1/2″ plywood if need be. Click the image below to download a PDF of the woodworking plans for this build. Click the image below to watch the build video. Installing insulation yourself is not a difficult task. It doesn’t take too long and, contrary to what some believe, is not typically a super-itchy experience. The last couple of times I did this it was easier than I expected and definitely worth doing myself. You don’t need much at all by way of tools, either. That’s it! Pretty simple as far as tools go. What is “R” Value and what do I need? The “R” in R-Value stands for resistance. R-Value is a measure of how well a material can resist the transfer of heat. Heat transfer is a two way street. When it’s hot outside, your insulation resists letting heat in. When it’s cold outside it resists letting your warm air out. In the United States, there are different requirements based on where you live and what type of insulation you’re doing. Here’s a chart to help you determine what you need. If you live outside the United States, be sure to check what you’ll need for your area. As far as how to actually install the insulation, please check out this video with step by step instructions for both faced and unfaced insulation. My dreams have come true! 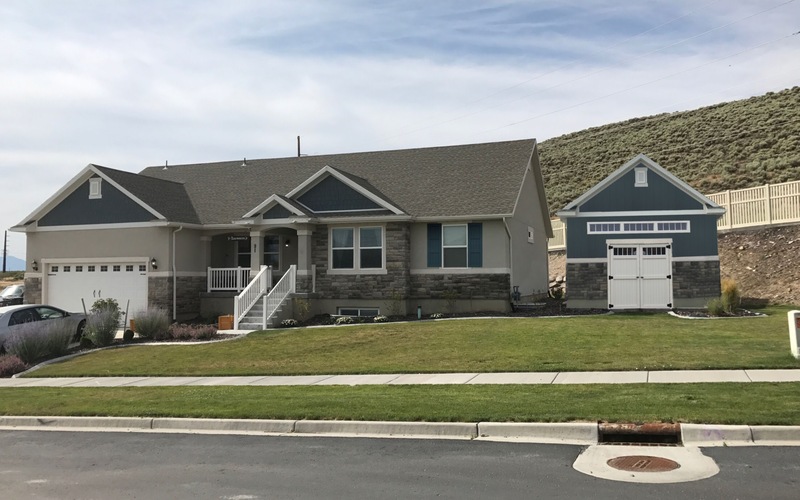 When we were looking for a new house a few years back, we really hoped to find one with a good amount of space and a three car garage, so that we could park both cars in the garage and then have some room for me to do woodworking and my many projects. We ended up buying our current home, which we love for a hundred reasons, but it didn’t have a three car garage. Katrina, knowing that I really wanted a work space, allowed me to pour a concrete pad for a wood shop as a sort of down payment on a future shop. Well, now that we have put the yard in, finished the basement and we’re finally getting a rock wall to replace our massive, weed-infested hill, it’s time to start on the shop. I got started a couple of weeks ago and it’s going well so far. To begin, I designed the shop in Google Sketchup, which allows me to get a feel for size, color, space in relation to the house, etc. After that, I mocked it up in Photoshop using our existing garage as a starting point and then bringing in some color and texture to make it fairly realistic. The second image below is my Photoshop job of what the shop may look like, though we’re definitely not 100% decided as of yet on colors, textures, etc. The size and shape are pretty accurate, though. This is the design for the new shop, rendered in Google Sketchup. This is my Photoshop job of what the new wood shop might look like. I decided to do 2×6 framing instead of 2×4 since I’ll be insulating it and adding a heating and A/C unit. The shop is 15′ x 15′, so it’s not a big shop, but I’m excited about it. I decided to do 9′ ceilings, with a loft for wood storage. I’m putting several windows in it, including a row of windows above the door, a 3’x5′ window on two of the walls and a smaller window on the fourth wall. Let there be light. The best part about that is that I bought all of the windows already, including several extra, for a grand total of $100 from a person in our area. Thanks, local online classifieds! They’re all used double pane, insulated windows and most of them are either sliders or crank-openers. I’m looking forward to putting those in. It’s amazing what you can get for cheap when someone is remodeling their home. 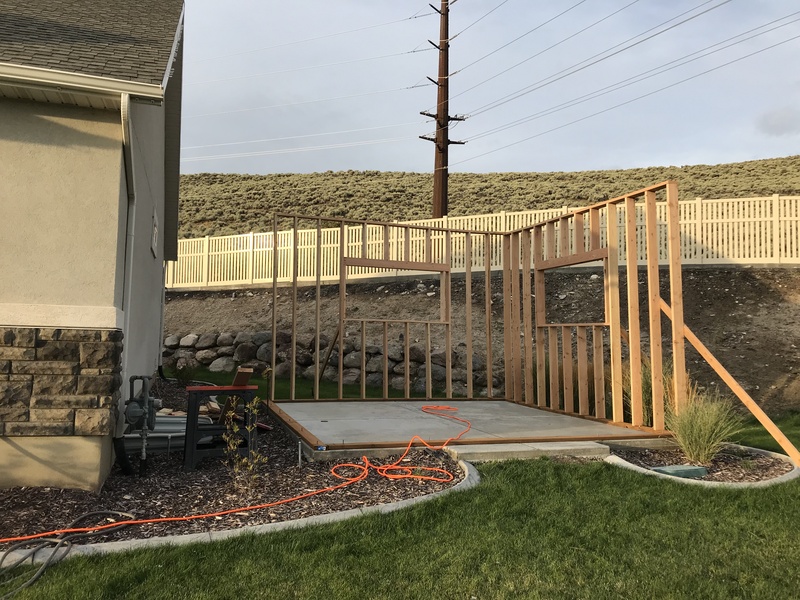 I bought a framing nailer (should have done that years ago) and have been building the walls one at a time and then getting some help from neighbors to stand them up and put them on the lag bolts in the concrete then tight them down. I have to say – 15′ x 10′ walls made out of 2x6s are extremely heavy. Definitely not a one-person job. My poor wife had her feet under one of the walls when it fell into place so she’s got quite a pair of bruises on her feet but luckily it looks worse than it is. Turns out this is way illegal. 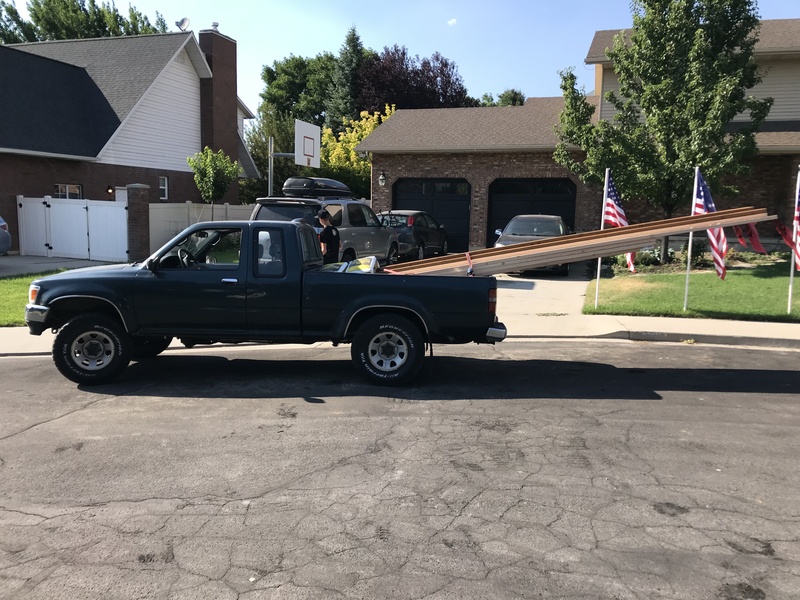 Apparently you can’t have 10′ of board hanging out of your truck bed. 🙁 Lesson learned! I did the first wall framing in the driveway. 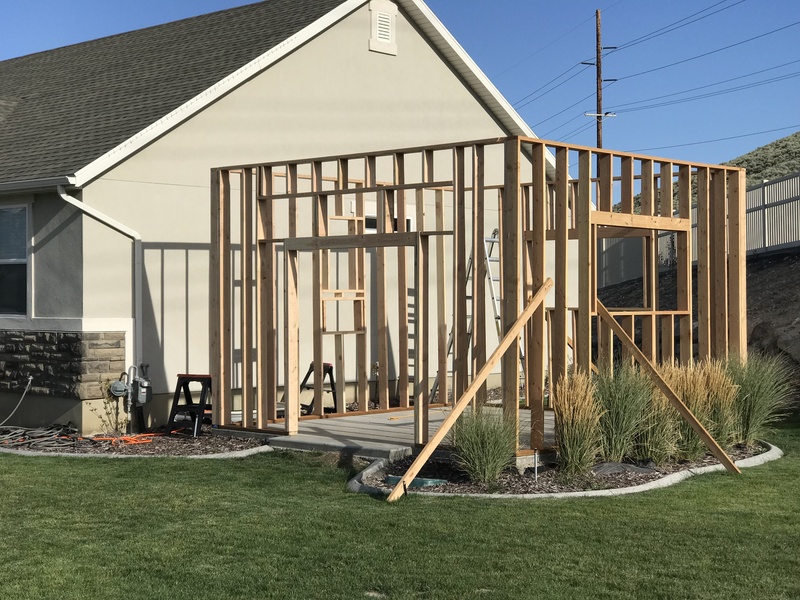 The four walls are up! With the four walls up, I started on the ceiling / loft floor. I used 2x10s and mounting brackets and it’s quite sturdy. Those 15′ long 2x10s are some heavy suckers. I finished putting those up and then, with Katrina’s help, put the 3/4″ OSB up for flooring. That made it way easier to work on the roof trusses (stick framing) without having to use a ladder to do it all. For the roof cuts, I used a great little truss calculator to get the angles, distances and other cuts, which was super helpful. Me no do math good, so that was kinda fantastic. It gives you the angles, the birdsmouth cuts, the distances where to cut them and everything. One thing that helped a lot on cutting the rafters was to create a template to make the marks faster. I created these small templates to slide onto each end of the 2x6s to make it really easy to mark every board in a hurry. It took me about 11 minutes to mark 24 boards, which is great. The templates took about 20 minutes to make. 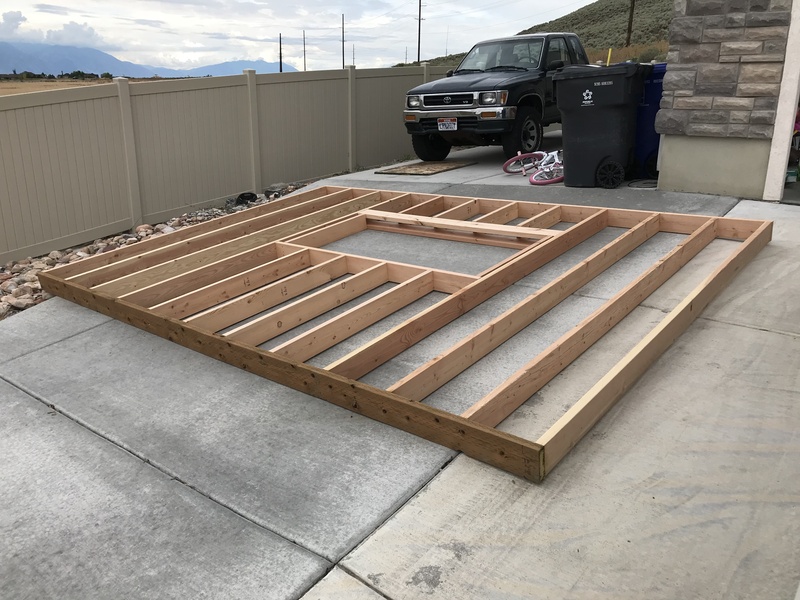 As of right now, the rafters are up and nailed to the ridge board, so now I’m ready to finish the framing of the gable faces and then I can put the OSB up on the roof. Yay! No injuries or accidents (other than my poor wife’s foot bruises) so far, so knock on wood. That’s it for now! More pictures coming soon and, of course, I’m videoing the whole thing for a complete how-to series on it from start to finish. If you want to learn about framing walls, windows, soffits, doors and closets, I already have some videos on those! This year for Mother’s Day, I told NilsyNils that I wanted a couple of planter boxes for our front walk area. I think they add a lot of charm and dimension to any area, and had pinned quite a few pictures of ones I liked. Nils and I looked at a lot of different tutorials, and naturally, he decided they were all crap and designed a new one. We spent a Saturday in the garage building these cute boxes and bonding via power tools. This is an inexpensive yet outdoor-ready planter box that can hold about 3 full bags of potting soil and has about 3 square feet of surface area. Each box consists of 9 cedar fence pickets and one 2 x 4. You’ll also need 1 1/4″ screws, 3″ screws, an optional brad nailer, and 18 gauge brads. Fresh DIY goodness, right in your inbox.